The International Preferences for Duchenne Treatment Study is now open in Canada. Jesse’s Journey has partnered with Johns Hopkins University, Parent Project Muscular Dystrophy, and other Duchenne advocacy organizations from around the world on this important study. 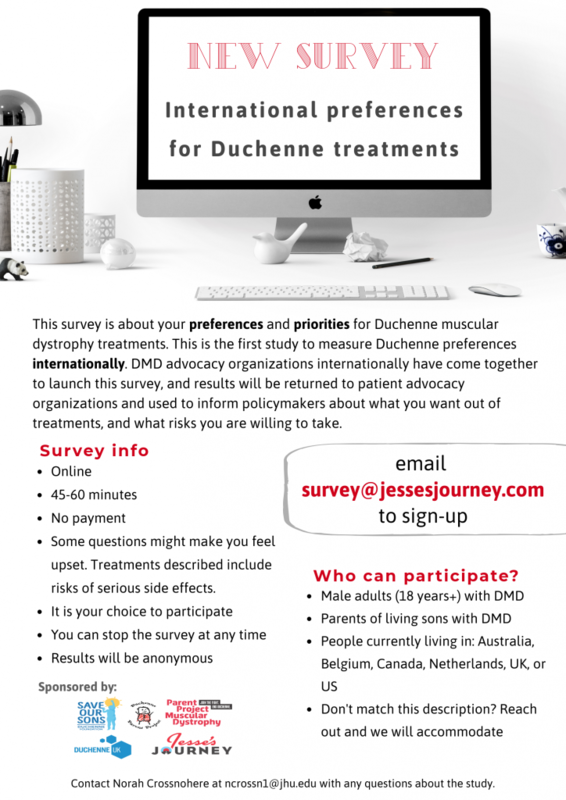 This survey is the first international study to measure the preferences and priorities of people with Duchenne and those of their families with respect to potential treatments. This research study will be collecting input from 60 Canadians via a survey including parents of children with Duchenne, parents of adults with Duchenne, and adults with Duchenne. Regulatory agencies such as Health Canada rely on input from patients and families to help inform treatment approval decisions, and the success of this project relies on the advice and support of experts in Duchenne – which means the patients and caregivers. The data collected in this survey will be shared with Jesse’s Journey and other patient advocacy organizations. These results will be used to inform policy makers about what the Duchenne community wants out of treatments and what risks they are willing to take. To take part in the study, email survey@jessesjourney.com. Your email address will be forwarded to the study coordinator who will email you a personal link to the survey.